Today is Natalie's 100th day of kindergarten! 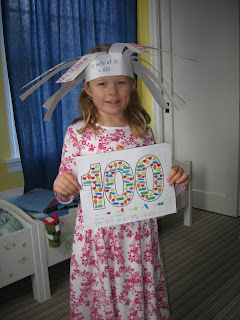 Here she is wearing the 100th-day hat that Graham and I slaved over till midnight doing prep work on. You can read more of my thoughts on her 100th day over at the Silicon Valley Moms Blog.